It’s been a busy few weeks in our new life. Catching up with work, endless miscellaneous life administration tasks, continually discovering that you don’t have that useful thing that you’ve always had but you put it in storage so you have to buy a new one … it all takes up time. Hence the delay with recording my exploits on this blog. That and the understandable preference for sitting down at the wharf sipping an excellent local Gewürztraminer rather than sitting at a computer typing. The cats arrived without incident, as expected, though one person in our relationship (hint: not me) almost spontaneously combusted with stress and worry about them. They were a little sad and sorry for themselves when we picked them up at the airport after their ten hour day travelling, but as soon as they were in their new home they were both pretty happy and running about. Drusilla loves the extra space and has taken to the house from day one; Ripley gets a little lost and confused occasionally but she’s beginning to see the advantages of big rooms with lots of sunny places to lie full length in. We’re still dealing with the incredible contrast from tiny, claustrophobic, noisy inner city Sydney terrace to spacious, sunny, country house. 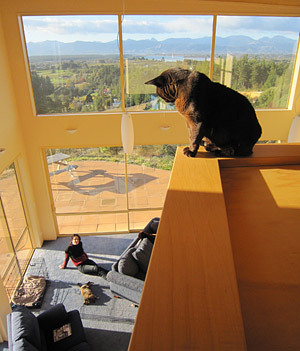 We’re surrounded by huge double glazed windows with astounding views down the hill to the coastal village of Mapua and Rabbit Island beyond, Tasman Bay, Nelson, and the mountains beyond that; and at night there’s a 180º vista of glittering lights in the distance. In the mornings there are stunning sunrises and mist rising from the forests, and snow is beginning to crown the mountain peaks. The view continually surprises and delights. As for Nelson, it really has become one of those places you don’t want to tell too many people about, because then they’ll all realise how good it is and come over and spoil it (whoops). There are groovy pubs (delicious local craft beers) and cafes (comfy mismatched couches and free trade coffee); people are really friendly, the food is excellent and there’s a thriving music scene in the area I’m looking forward to exploring. It’s just big enough to be buzzing and small enough to still have that small town feel, and you can always get a parking spot. Everywhere we’ve gone for food and drink has been really good. Frankly, there’s nothing I miss about living in Sydney (except for friends of course), and it confirms to us how complacent and mediocre Sydney has let itself become since the big high of the 2000 Olympics. 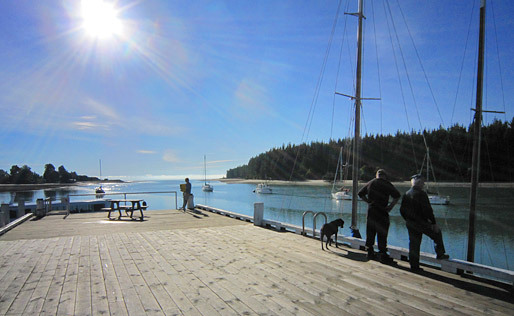 Five minutes down the hill from us is Mapua, where some excellent cafes and restaurants cluster around the wharf and a ferry takes you over to Rabbit Island (walking and bike trails). Jellyfish is already a favourite—great breakfasts, and you can stop in for a glass of wine and some delicious nibbles and watch the sun go down over the ocean (many cafes here are licenced, which is very civilised). Nearby is the Golden Bear Brewery—craft beer, LA Mexican food and live music—looking forward to that opening again next month. 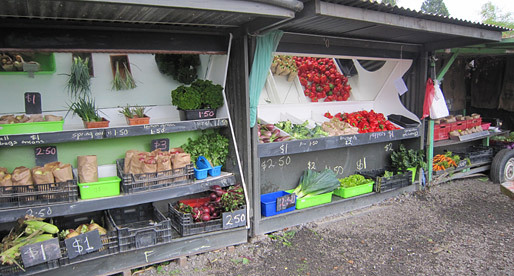 To get our veges, we drive to a nearby farm known as Todd’s, where fresh food, grown about ten metres away, is displayed for your delectation; count up your total bill and leave the money in an honesty box. Inexpensive real food, straight from the farmer, that tastes ten times better than the garbage that Woolworths, self-proclaimed ‘fresh food people’ sell in the supermarket. Then we buy apples and pears from a stall on the side of the road on the way home. Sure we don’t get to see the occasional big gallery show or exhibition, but it’s a very small price to pay. That said, on Sunday night we saw Sir Ian McKellan at the Nelson Theatre Royal, in his one man show to raise funds for the Isaac Theatre Royal theatre in Christchurch, damaged by the terrible earthquakes. A minute around the corner and we were at the theatre. McKellan started with the Balrog scene from The Lord of the Rings (from the book)—he had his sword Glamdring with him—and then most of the first half was a really casual Q&A session with the audience (no, I didn’t think of anything to ask on the spot! ), broken up by singing an old song, and reciting poems by Wordsworth and Gerard Manley Hopkins, among other stories and anecdotes. The second half he encouraged the audience to call out all the plays of Shakespeare while he ticked them off in a ledger, stopping to do the most astounding, magical scenes from Richard II, Romeo and Juliet, Henry V, Coriolanus, Hamlet etc. You could have heard a pin drop when he went into character. It was an amazing night, like being invited over to his house for a chat. We both feel a peace and happiness that we haven’t experienced in years. If it’s been a busy day we can drive for five minutes from the house and be on the shore at Ruby Bay, hearing the waves pull back over the pebbles, looking out to the horizon and breathing lungfuls of fresh air. I’m also working more efficiently and creatively, no longer continually interrupted by slamming car doors and people spitting on the pavement as they walk by and jumbo jets flying ten feet overhead. Instead I’m getting into ‘the zone’ again when I work, spending solid time working on a job without distractions—something I haven’t done for quite a while. Apart from the obvious, there are many little things that make life here better than in Sydney. You can always get a park in Nelson—the town cleverly has large carparks behind the shopfronts, and parking only costs a dollar an hour (free Saturday afternoons). You don’t feel like you’re continually battling hordes of people to carve out a bit of breathing room all the time. People smile and chat in the shops, and still say hello when you pass them on a walking path. This afternoon a kid rode up behind us on his scooter when were out walking, and when we got out of his way he said “thankyou!” as he passed. Hell, even booking a seat at the cinema is easier—no online registration rigmarole and we could select our seats. But it’s the space that gets me, after the cheek-by-jowl living of Sydney. There’s just more room per person. Well, enough of my rave. Suffice it to say we don’t regret our move for a moment, and doubt we’ll ever be returning to city life. Next weekend I’m flying across the strait to Wellington and Wellycon, NZ’s biggest boardgame convention, for a weekend of gaming and meeting new people. I’m even part of a Q&A panel on Saturday night, in my role as occasional graphic designer of boardgames. Should be great fun; I’ll tell you all about it when I get back. you saw sir ians show, I read about on his blog. Rave away. I would most certainly. Man. I have to go to New Zealand. Wow, beautiful place you’ve moved to. We would love to travel to New Zealand and Australia one day and my wife and I are slowly making plans to do so. Take care. What a great photo. Bresson would be proud of that one. Sounds like you made the right move. Now I want to visit Nelson! Superjosef: I admire the way you sketch every day – a habit I would like to develop and stick to. Guy: Plenty of room for guests mate, come and visit! Loved reading about your experiences. Sounds like a wonderful decision! Right. We’re moving in down the road. We are counting on it, and if the four of you all came at once that would be fantastic (there’s even space for two couples, though you’d have to fight for the ‘guest suite’). Start planning mate!